"I declare the Olympic Games of Tokyo, celebrating the 18th Olympiad, open." Although there have been official documentaries with nearly every Olympic� games, a few notable ones stand out. Leni Riefenstahl's epic Olympia is the standard to which all of them must measure up, her notoriety for Triumph of the Will notwithstanding. 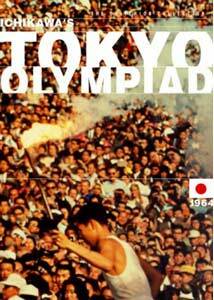 One of the few that can do so as a work of art is prolific director Kon Ichikawa's document of the 1964 Olympics in Tokyo. Where Riefenstahl emphasized grace and poetry in motion, making the athletes seem effortless or weightless, Ichikawa takes the very opposite approach. His emphasis is on the strain of competition and the exertion of the human body to the utmost extremes. His athletes seldom move gracefully, but in slow motion their muscles bulge, their faces contort in agony, and their grunts and groans are plainly audible. His version of the games is not one of otherworldliness, but is firmly rooted in the physical reality of pain, effort and trial. Seeing the women's hurdles in slow motion is almost painful as their muscles are distended and their faces demonstrate the misery of pushing their physiques beyond the normal. Ichikawa also disorients the viewer more than once. After the preliminaries (oddly beginning with the demolition of the structures that were in the site) and the opening ceremonies, we're plunged immediately into the 100m dash without preparation or any notice of what exactly it is we're seeing until after it's done. Indeed, this tendency to be artistic rather than documentarian got Ichikawa in substantial trouble with the IOC, which forced a recutting of the film (restored to its original form and length here, thankfully). Although he uses a fair amount of sun symbolism, echoing the Japanese flag, he neither presents a Japan-focused film nor a sugarcoated view of the festivities. This is particularly true in his capturing the many rain-drenched events; the hammer throw in a downpour is shot in black & white, giving it the look of an edgy film noir. The cycling events are another example of Ichikawa's odd selections; completely disregarding the indoor events, he focuses solely on the outdoor race, emphasizing the blinding speed and the constant danger that comes from traveling in tight packs at high speed. Ichikawa clearly doesn't think much of the race walkers, giving them one of the most mocking moments in the picture. After focusing on their ungainly movements, he draws his camera close to their waggling buttocks, making them seem downright ridiculous. The quirkiness isn't limited to the athletes either. Very often Ichikawa will cut away from the events to let us know the outcome from the expressions on the faces of the viewers. Even then, in slightly crude humor, he focuses on the rotund bellies and aged wattles of the onlookers. Only on occasion, and seemingly as an afterthought, are winners of events announced. The gymnastics events are reduced to a single episode of time-lapse photography (the one time where Ichikawa does allow for a vision of grace). Perhaps the most intimate moments are given to Abebe Bikila, winner of the 1960 and 1964 marathons, the latter of which concludes the film. His quiet concentration shines forth the human spirit in the face of difficulty like no other in the film, and almost signals a return to the grace of Riefenstahl's athletes. It's particularly interesting to see these games with nearly forty years of hindsight. The opening ceremonies are modest, limited to a parade of the athletes, a gun firing, skywriting the Olympic rings and the lighting of the cauldron. No mega-million-dollar extravaganzas here. Also notably absent is corporate sponsorship and the bedecking of athletes with logos; other than an occasional Coke sign and a single Adidas shoe, there's hardly a logo to be seen, clearly an indication of a more innocent time. Image Transfer Review: The anamorphic widescreen picture looks beautiful, with excellent color. Fine detail is present throughout, and the opening ceremonies are appropriately colorful. Since this is a documentary shot under challenging conditions, there is plenty of grain to be seen, but it's all appropriate. The source print is practically immaculate. The one defect I noted was an occasional moment of dot crawl and aliasing, but this was fleeting and not very frequent. Otherwise, first rate and beautiful. Audio Transfer Review: Unfortunately, there are serious limitations to the audio tracks. The music is warbly, tinny and unpleasant throughout. There's also occasional noise and crackle, though it's passable. What little dialogue and voiceover there is tends to be in Japanese so I'm not able to assess whether it's clearly understandable. But I'd guess this is probably about as good as such a film is likely to sound. Extras Review: Despite the length of the feature, Criterion has managed to cram some valuable extra features into this package. Frequent commentator, film historian and Olympics buff Peter Cowie provides a full-length commentary with hardly a pause to be heard. He is mostly in "Olympics buff" mode here, though, providing tons of Olympics trivia with a smattering of information about other Olympics documentaries to give Ichikawa's work perspective. He provides much that is useful, such as the significance of the women's volleyball finals featuring the USSR and Japan; the uninitiated viewer might wonder otherwise why Ichikawa spends so much time on this match. The comments tend to be a bit heavily overweighted towards information on the 2000 Olympics in Sydney, though. Supplementing this is an interview (32m:09s) with Ichikawa in 1992 regarding the making of the film. This full-frame piece fills in the history of the film admirably without duplicating Cowie's material significantly. A bulky pamphlet comes with the disc, containing an essay by George Plimpton as well as a text symposium regarding the film, dealing with its controversial history and content. All are quite worthwhile reading. Wrapping up the package is a lengthy listing of all of the medal winners at these game, which essentially creates the record that Ichikawa declined to create; in retrospect, it might have been more fitting to leave them out. An interesting take on the Olympics in a more innocent era, with an enthusiastic commentary and plenty of additional reading material, topped by a nice video transfer.